Time It Right and Sell It Fast! There are many steps you can take to ensure a speedy sale. 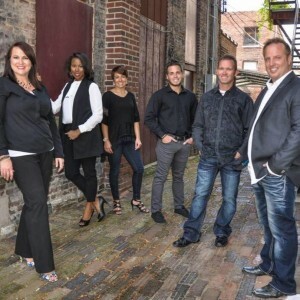 Setting the right price, making an excellent first impression and selecting the best real estate team with experience and a proven marketing plan are all essential to attracting buyers, but what else can you do to get the offers rolling in? 1. The first component to selling your house fast is making sure you set a competitive asking price. Sellers often think they should start the asking price high and then lower it later if the house fails to sell. But that can result in a slower sale – sometimes even at a lower price. If the price is too high, many buyers and their agents will stay away, assuming you’re not serious about selling or you’re unwilling to negotiate. “The first 30 days’ activity of your house being on the market is always the best activity you’re going to see. When meeting with your real estate agent they should ALWAYS provide you with a comparative market analysis that provides comparable listings and sales similar to your home, as well, as their detailed marketing plan. This is a critical step before moving forward in listing your home. A recent study showed that within the first week your house is on the market it gets four times more visits online than any other time. 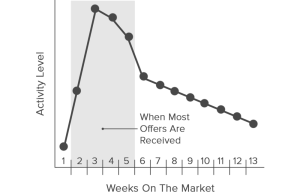 After approximately 4-5 weeks on the market activity may decline by up to 75% so it is critical to price it right from the start. Starting with a lower price might in fact increase your chances of selling. 2. 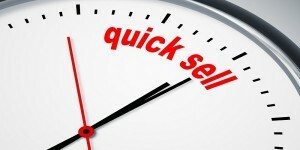 The second component when selling your home fast is putting your house on the market at the right time. There is a flexible time slot. Studies showed that homes listed between 2 certain dates sold one week faster, and at a slightly higher average than any other season. The right and perfect time may be a bit surprising, but it is between December 21st and March 21st. 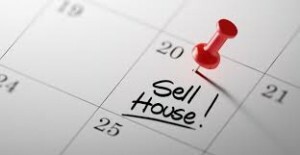 Another key part to selling your house is to list it on a Thursday or Friday. That way when people get together with their agents on a weekend to do some house shopping, your home is fresh in their mind. If you are considering selling your home contact The Romanski Group for a consultation and evaluation of your home and current market price. 3. The last component when selling your house fast is investing in improvements. NOTE: you don’t not need to remodel your entire house! These improvements can be as simple as painting in neutral colors, improving or adding landscaping for curb appeal and decluttering before our professional photographer takes pictures of your home. Other ways to improve your home without digging deep into your bank would be having your carpets professionally cleaned and power washing the exterior of your home and deck. Simple and small improvements don’t have to weigh you down and can really improve the selling time for your home. There are so many things to consider when selling your home. How to time it right and how to sell it fast are always two major concerns for homeowners. If you are curious to know the value of your home contact The Romanski Group today at (765) 404.5095!